Re-build and recover faster after your workouts. When you’re finished exercising, Isagenix AMPED Recover can help you to quickly and efficiently repair the damage that’s been done to your muscles. Branched-chain amino acids (BCAAs) stimulate the growth of strong, resilient muscles, while L-carnitine supports muscle maintenance and recovery after a bout of heavy lifting. Each time you work out, your muscles break down just a little bit in order to grow larger and stronger. It’s important to rest after a training session so that your muscles have time to repair themselves. AMPED Recover has been scientifically formulated to help you recover quickly after a workout, allowing your muscles to rebuild after a trip to the gym. A combination of muscle-building BCAAs also helps to improve performance and speed up the post-workout recovery process. Leucine is responsible for stimulating the creation of new muscle proteins, while isoleucine and valine stimulate nutrient uptake to keep muscle cells healthy. L-carnitine also helps to reduce muscle damage and prevent exhaustion after a workout. To enjoy even greater results, try combining AMPED Recover with IsaPRO or IsaLean PRO. These protein shakes are designed to help build lean muscle while burning excess fat. AMPED Recover helps to support muscle tissue growth and reduce fatigue after a workout in part by including L-carnitine in its formula. This compound helps to reduce oxidative stress and lessen damage to muscles both during and after intense exercise. If you have an intolerance to gluten, a soy allergy or can’t digest lactose, you’re still safe to use this product after your workout. Its formula doesn’t include gluten, dairy, or soy products. BCAAs, including leucine, isoleucine and valine, help to support muscle development and aid in exercise recovery. They work quickly to reduce fatigue. Why should I used AMPED Recover after my workout? Both L-carnitine and BCAAs are combined to maximise the supplement’s effects, helping to support post-workout recovery and muscle tissue growth. All AMPED products are designed specifically with athletes in mind. Any active adult over the age of 18 who wants to enhance their workout can use this product in combination with other products from the new Isagenix AMPED range. Combine one serving of with 8 ounces of water and drink either during or immediately after working out. 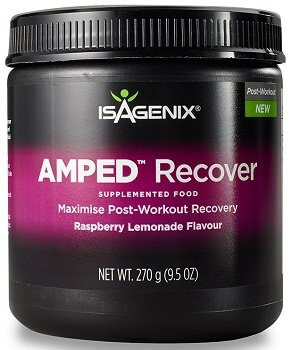 Purchase AMPED Recover online to optimise your post-workout routine starting today!